We have two (2) fixtures that display 60 rings. First, pack a big wallop in as small a space as possible with a display that measures 10 ” square and 15” tall. Or, show the same 60 rings in a sectional format. This display is divided into four (4) distinct sections that allow us to place different rings categories within the same fixture. 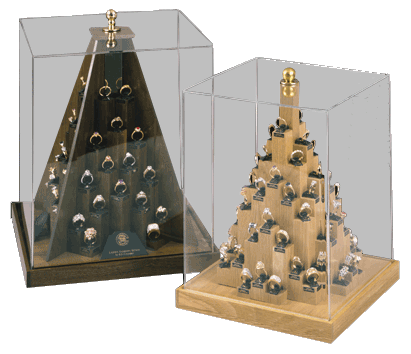 One side could feature Men’s rings; another Women’s; and another Sterling Silver; while each can be individually signed to call attention to the type of product within that section. This display is 13” square and 16” tall.